Prince George recently launched the embedded Domestic Violence Unit (DVU). 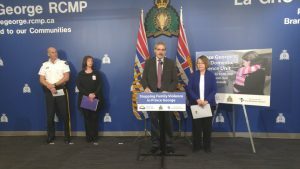 The team is comprised of an RCMP officer, a community-based victim services worker from the Elizabeth Fry Society, and social worker from the Ministry of Children and Family Development. The purpose of this team is to provide a collaborative response to highest risk domestic violence cases in Prince George. This is the ninth embedded DVU in British Columbia, receiving funding from the province’s Civil Forfeiture Fund. This model of wrap-around services has been very effective throughout the province. The media launch took place on October 17th, 2016. Speaking at this welcome event were Minister Mike Morris, MLA Shirley Bond, Executive Director of the Elizabeth Fry Society Kathi Heim, and Inspector Warren Brown of the Prince George RCMP.